The balm of winter rain is already coaxing carpets of green to sprout in wide swaths of Northern and Southern California that were scorched by deadly wildfires just a few months ago. To most of us, the vigorous grass sprays and dazzling wildflower bloom are a welcome sight, coloring over the dark remnant of fire. But not to everyone. Many of the fast-growing plants are non-native and fire-prone, making it likely that the hills will be charred black again sooner rather than later. That’s certainly true in Malibu Creek State Park, three-quarters of which burned in November. 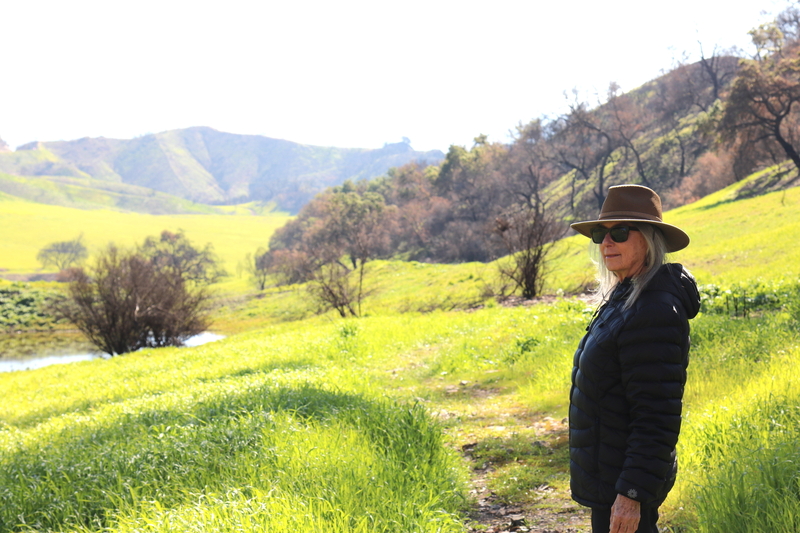 Suzanne Goode, a senior environmental scientist with the California Department of Parks and Recreation, has been based there for nearly 30 years, with wildfires a constant threat. “Driving in after the fire I was shocked, taken aback by the extent of it,” she said. Now she looks out on the green, rolling hills teeming with vegetation — and to her it’s an awful sight. Dangerous because when fire wipes out native chaparral and scrub, they can be replaced by the non-native plants that accelerate fires and may serve no useful purpose, providing neither sustenance nor habitat to wildlife. The shallow-rooted plants don’t hold soils well, adding to the threat of erosion in burned areas. The parks necklacing the Santa Monica Mountains have burned countless times. But November’s Woolsey Fire was particularly damaging, burning 99 percent of Leo Carrillo State Park in addition to the damage at Malibu Creek. Oaks and sycamores vaporized where they stood. Some trees tipped over and turned to white powder on the blackened ground, their limbs reduced to chalky outlines reminiscent of crime scenes. The fire burned 150 square miles in Ventura and Los Angeles counties, killed three people and destroyed 1,500 structures. The Camp Fire that leveled the Northern California town of Paradise was the state’s deadliest, although it burned at a lower intensity than in Malibu and topography, vegetation and ownership in the Northern fire area are vastly different. 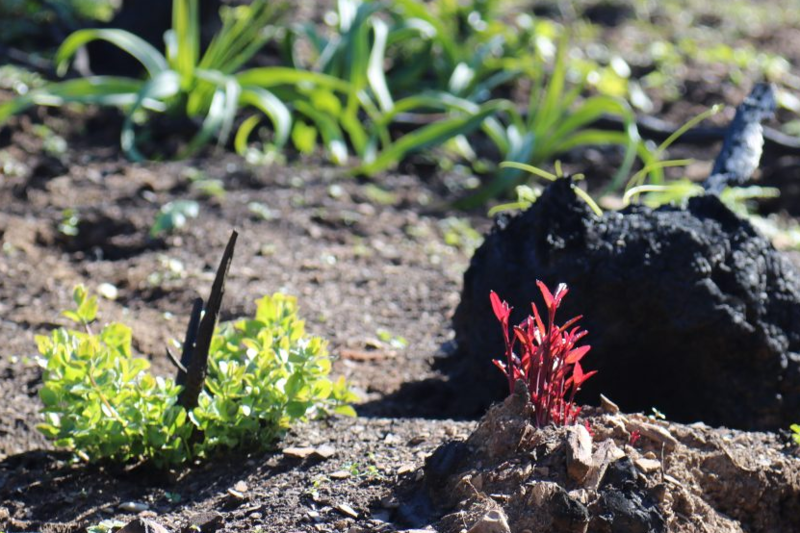 In the aftermath of wildfires, a fierce battle for survival begins, pitting native plants against the aggressive newcomers. Part of the problem for state land custodians is biology: Native plants tend to grow slowly, sometimes requiring precise conditions of soil, water and sun to thrive. Some take two to five years to come back. Some plants thrive in soil enriched by nitrogen released by wildfires. While these slow pokes are gathering to re-establish themselves, weeds — the unwanted plants — are not particularly choosy, adaptable wherever they might root and able to outlast all else. Mustard plants, for example, which are now blanketing many charred hillsides and putting out cheerful yellow flowers, are masters of survival: Even the weed’s dead stalks produce a chemical that inhibits the ability of other plants to grow around it. And in some cases, the heat of a wildfire stimulates growth in invasive plants’ underground seed banks. When their sprouts come up, they draw nutrients from a nitrogen-rich soil left by fire. That pulse of fertilizer gives invasive plants a boost, and their head start is difficult to overcome. Grasses, in particular, are volatile fire-starters, burning quickly and spreading the flames. They produce embers that winds can carry a mile or more, igniting new blazes far from a main fire. Carla D’Antonio, a professor of ecology at UC Santa Barbara, has been researching how forests and other areas recover from fire. She’s most concerned about non-native plants, which may look pretty but could ultimately spell the end of native California species. “I see grass surrounding remnant chaparral shrub and I just think, ‘Oh shoot, if another fire comes through here, those guys are toast,’ ” she said. Several state universities, especially UC Riverside, are keenly studying how to maintain chaparral, a complex mixture of plants that represent what parts of California looked like before humans altered the landscape. D’Antonio’s work, in particular, has shown how difficult it is to reseed chaparral. 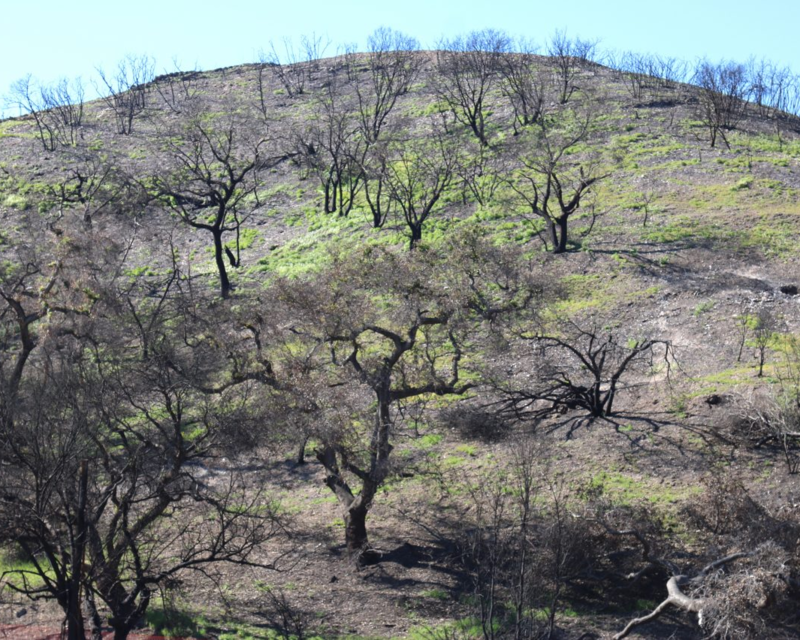 Some plants are already growing on a charred hillside in Malibu Creek State Park. Naturally occurring wildfires can be beneficial by removing weak growth and dead plant material. But their increasing frequency has contributed to “type conversion,” a wholesale change from chaparral to invasive weeds and grasses, signifying the loss of an iconic California landscape filled with manzanita, sage and toyon, a native shrub. That’s why Goode and her team focus on removing invasives and replanting natives. Under most circumstances, park personnel would replenish lost plants by taking trees and shrubs from Malibu Creek’s native plant nursery. But the nursery was destroyed in the Woolsey Fire. The population of coastal live oaks that survived the Woolsey Fire would have been bolstered by hundreds of saplings planted in previous months. But most of those young trees did not survive the blaze. The absence of trees causes concerns about the slopes’ ability to store water. A team from Cal Fire, the state’s firefighting agency, was on the ground in Malibu two weeks after the Woolsey Fire, assessing risks to watersheds and structures from sediment and rocks cascading down denuded hillsides. The team issued a report estimating that more than 60 percent of the burned area was at high or extreme risk for erosion in winter rains. Cal Fire does not perform fire rehab work—remove grasses or replant trees — but does have crews laboring most of the year to reduce highly combustible vegetation, said Kevin Conway, who manages a 70,000-acre forest research project for Cal Fire. The agency has received nearly $27 million for six forest-clearing crews and has requested funds for four more in the next state budget. Federal and local authorities also have crews across the state removing dead trees and clearing flammable brush, already preparing for the next fire cycle. The triage falls mostly to the local managers. Goode said she’d need a staff of 25-30 people to keep up. She has four. Decades of progress in eradicating fire-prone plants can be undone with a single fire, “years of work going up in smoke,” she said. Now she has to prioritize which weeds to attack, ranking them according to their fire potential and ignoring plants that were formerly on the park’s most-unwanted list.